Stephanie Boluk and Patrick LeMieux. Metagaming: Playing, Competing, Spectating, Cheating, Trading, Making, and Breaking Videogames. Minneapolis: University of Minnesota Press, 2017. 392 pp. 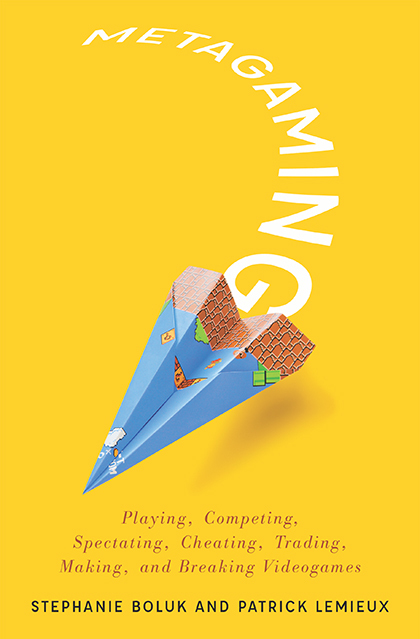 Stephanie Boluk and Patrick LeMieux’s new book, Metagaming, has convinced me that video games are not games. They are “software sandboxes” where games take place, but in more varied and interesting ways than the industry or insular gamer communities typically acknowledge. Forget playing a game as intended. Boluk and LeMieux shine a hundred spotlights on play’s diversity in, on, around, between, through, and without video games. Their wildly eclectic book careens from competitive e-sports and video game spectatorship (be it Twitch.tv streaming or YouTube) to hacking, modding, speedrunning, experimenting, and critiquing video games—all valid ways of engaging with the medium that tend to fall outside analyses which see these activities as merely the metagame (ancillary to the game as a self-contained commodity). The first effect of reading this book is a tremendous ontological flattening in the concession that there is no game without a metagame—every act of play (normative or not) is “meta” in its relationship to game software. The second is a drastic expansion of what it means to engage with video games. Metagaming is exhaustively researched and meticulously detailed. You likely made it this far into my review because you already know what a metagame is. But rest assured you don’t know all a metagame can be. The book’s more than 350 pages brim with examples. Some are to be expected, such as the still-evolving competitive metagame for Super Smash Bros. Melee (2001), which hasn’t received an update or a patch in seventeen years. Other examples are surprising, such as the discussion of Mary Flanagan’s self-reflexive [giantJoystick] installation, or indie platformers such as Braid (2008) that reference other games (and are therefore games about games). At times, Metagaming’s forays into gaming’s great beyond seem politically grounded in important contemporary issues by virtue of how some players’ metagames pass as unquestioned norms: specifically, cisgendered, masculine, able-bodied players. Especially apt are the book’s discussions of blind speedrunners and feminist critiques of commercial games. At other times, the book journeys far into what seem like tenuously related discourses, such as Sartre’s notion of seriality, the minimalism of radically abstract art, or anamorphic distortions in paintings from the Northern Renaissance. It’s all very interesting, but eventually one throws up one’s hands and exclaims that this is a book about anything and everything—the history, theory, culture, philosophy, technology, ethnography, economics, art, visuality, and design of games (the book does actually link you to the authors’ experimental games too) along with anything that can be connected to games. Like Dark Seer’s ultimate “Vacuum” ability in DotA 2 (which Boluk and LeMieux describe as part of a key turning point at Valve’s 2012 $1.6 million DotA 2 tournament), it’s as if Metagaming centripetally inhales every conceivable disciplinary approach to studying games and groups them under one single heading. This is, of course, the rhetorical point of the book: to expand our definition of metagame until it bursts and destroys our prior notions of what it means to play a video game. A happy word of caution: beware the straw man. I do not believe most readers would challenge more than one or two of the book’s numerous examples. So, then, why all this trouble? Metagaming’s intervention, it suggests, goes back to the idea in play theory of the “magic circle” (about which Huizinga famously said, “inside the circle of the game the laws and customs of ordinary life no longer count”). Boluk and LeMieux themselves admit the magic circle is somewhat a straw man, and they even reference Eric Zimmerman’s comment that knocking down this myth is a “rite of passage” for game scholars. Huizinga did not mean that the game was somehow hermetically sealed, that players are constituted by the game’s temporary legislation (that player subjectivity waits outside). This notion goes against the entire thrust of both Huizinga and Caillois, who saw games and the cultures that played them as inextricably intertwined. So, who really needs to be convinced that the metagame matters? Well, we all do. As Boluk and LeMieux argue, something like a “magic circle” is, sadly, alive and well today in the venomous, misogynist gamer communities that are so hostile to a strong feminist or queer presence in their world of gaming. The contrast is perhaps murkier when it comes to treating industry as a “magic circle jerk”; this bogeyman is somehow both always obscuring and yet simultaneously failing to stop the metagame. In either case (and in several others), specifically and repeatedly tying metagaming to the margins of the world of gaming (including the players marginalized there) makes palpable the narrowness of how we (even scholars) think of games. As each example accumulates, the ontological flattening of all instances of play (as “meta” to the game) is expressed as the elevation of innumerable, diverse perspectives and voices who play different games (or play games differently). For this reason, Metagaming’s tendril-like, omnidirectional spread is especially empowering and useful for discussions of video games today. Johan Huizinga, Homo Ludens: A Study of the Play-Element in Culture (New York, 2016), p. 12. See Roger Caillois, Man, Play, and Games, trans. Meyer Barash (Urbana, Ill., 2001).